One of the fun things about the craft beer world is the diversity of styles. You can take a quick dip into a style or two you normally don’t drink or don’t even like just to see how things are going in that corner of the craft beer world. As I’ve previously written, I’m a fan of the big hoppy beers. Last year I decided to branch out a bit and tackle a style I was quite lukewarm about: Wheat Beer. And in doing so discovered some world class beers along the way. This year I decided to tackle two categories that I have had a long dislike for (with very rare exceptions): Brown Ales and Lagers. This post is a recap of my Brown Ale Adventure. What can I say about the Brown Ale? Boring was the first word that came to mind before starting this adventure. “Meh.” would have been my reaction. I’d much rather have a Stout or Porter if I’m going for a dark beer. Now that I’ve explored this style more I can honestly say I’ve gained an appreciation and respect for the style. So, 12 beers in the past 18 months or so isn’t a large sampling but enough to give me a good idea of the variations of the style. I tasted some decent beers, some nice beers and a couple of outstanding beers. 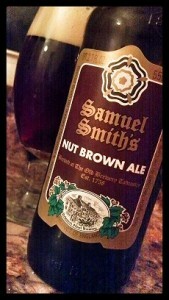 My favorite of the bunch was Samuel Smith’s Nut Brown Ale. This is the one Brown Ale that actually made me say: “This is a fantastic Nut Brown Ale!” Words I never expected to utter along the way. As far as the American Brown Ale goes I’d have to give the nod to Roosterfish Brewing Original Dark Nut Brown Ale out of Watkins Glen, NY as my favorite amongst the sampling I had. It hit every note I’ve come to expect from a Brown Ale and it was velvety smooth. Considering this was Roosterfish’s first beer and is celebrating its 10 year anniversary I’m not surprised they do such a great job of it. Overall, I’ve come to appreciate the style a lot more than I had previously. Still not a favorite style of mine but no longer do I have to frown when presented with a Brown Ale.